Fantasy Flight Games posted a preview of their upcoming expansion to the dexterity dice game, Dungeon Fighter: The Big Wave. The setting of this second expansion will introduce new watery monsters and equipment. 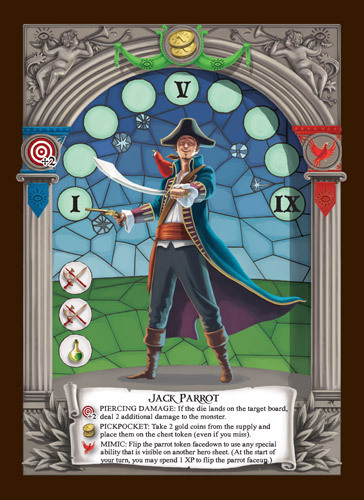 Featuring the legendary Black Lagoon Creature, oxygen tokens (that track player’s breath), and healing spells, designers Aureliano Buonfino, Lorenzo Silva, and Lorenzo Tucci Sorrentino will still get players caught in the tide with a new choking ability and a new hero, Jack Parrot. The Big Wave is currently available for pre-order and is expected to release soon. Fantasy Flight Games announced Fire at Will last week, which is an expansion to 2011’s Dungeon Fighter. If you are not familiar with Dungeon Fighter, it is a cooperatiave, dexterity, dice game designed by Aureliano Buonfino, Lorenzo Silva, and Lorenzo Tucci Sorrentino. Players are adventurers trying to survive monsters as they explore dungeons. During a turn in the game, cards with events and monsters are revealed. If monsters are encountered, then they must be fought by physically tossing dice towards a target board. Fire at Will is the first of four planned expansions themed around the four elements. This this expansion, which focuses on the power of fire, will have players tossing dice through rings of fire that allow damage to be done even if the dice do not land on the target. The expansion also introduces burn tokens that get placed on monsters and at the beginning of a turn, one token comes off causing damage in addition to other damage during that round. Fire at Will introduces you to a new heroine: Melissa, The Fire Sorceress. As that casual smirk on her face suggests, she can play with the most dangerous fires without getting burned. Since she’s an expert in fire magic, you’ll likely want her in any party of heroes journeying through the fire mountains. Her Agile Instincts ability, when activated, prevents her from suffering damage if you throw a miss. Activating her Sworn Enemy ability allows her to deal four points of additional damage to any demon she fights. Melissa also uniquely possesses the Fire Sacrifice ability. It allows you to place three burn tokens on a monster, but only if the group’s leader is willing to suffer one point of damage. Sometimes the best way to be a hero is to take one for the team, but you must decide for yourself whether fire magic is worth the sacrifice. Dungeon Fighter: Fire at Will will be released in the third quarter of 2014. Fantasy Flight Games announced the first expansions for Dungeon Fighter, a fully cooperative dungeon delving board game, published in 2011. Fire At Will and The Big Wave are designed by Aureliano Buonfino, Lorenzo Silva, and Lorenzo Tucci Sorrentino who also designed Steam Park and 1969. First of four planned expansions, Fire at Will is themed around the element of fire. Players will navigate a burning cavern and combat flame-breathing monsters with flammable weapons and BBQ armor. 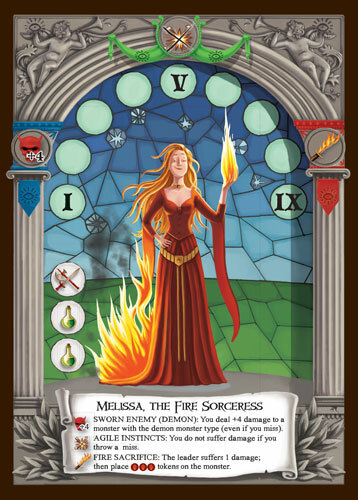 Melissa, The Fire Sorceress joins the party of heroes as an expert in fire magic, and all heroes can use experience points to purchase new spells. Game board templates change the landscape of the target board, while props such as the firewall and the fire ring add new challenges to this light-hearted, dexterity-based board game. New monsters, weapons, items and armor will be incorporated to the base game to aid players in surviving the dungeon and defeating the boss. Surf’s up in The Big Wave, the second expansion where the heroes, joined by the pirate Jack Parrot, travel to a fetid swamp and face off against a host of beach-dwelling monsters. More new equipment and power cards arm players with water magic to help them conquer The Great Cthulhu. Water elemental dice, new props, and new game board templates give players additional dexterity-based challenges in this water-themed expansion.